It all began, like so many worthwhile things begin, with a dream. The dream was that of someday lead-ing one of the finest of all Latin-American dance orchestras and it belonged to a gifted young Puerto Rican lad and native of San Juan — Tito Rodriguez. Today the dream has become a reality. But, like all dreams that eventually come true, it took hard work and determination plus talent. Tito also had something else in his favor — an inherent love, understanding and appreciation for the music of Latin America. Tito's early, most formative years were centered around his aptitude for music. He found it com-paratively simple to master the technique of any musical instrument he wanted to play; he learned to play most of them. And he learned something else — he had a voice. It was the kind of voice people liked to listen to, it created excitement, and it brought him fame. As vocalist with the Xavier Cugat and Enric Madriguera orchestras, it wasn't long before Tito Rodriguez was being heralded as the Number One Latin-American Singing Personality. This would have been success enough for most people, but for the irrepressible Tito it was only the beginning. He still had his dream, and now he was in a better position than ever before to make it come true. So it was, with a thoroughly tested musical apprenticeship, that Tito Rodriguez launched his own ten-piece band nine years ago. Few aggrega-tions have ever had a more meteoric rise to fame. The band has been acclaimed throughout the world, and the only thing that worries the lad from Puerto Rico these days is where to put the hundreds of citations he has been awarded. Of the many honors to come his way, Tito is particularly happy about the 1952 award from the Century Conservatory of Music of New York City, and the coveted honor from the famous Spanish newspaper, La Prensa. For two consecutive years, La Prensa has voted Tito's orchestra the outstand-ing orchestra of Latin-American rhythms. 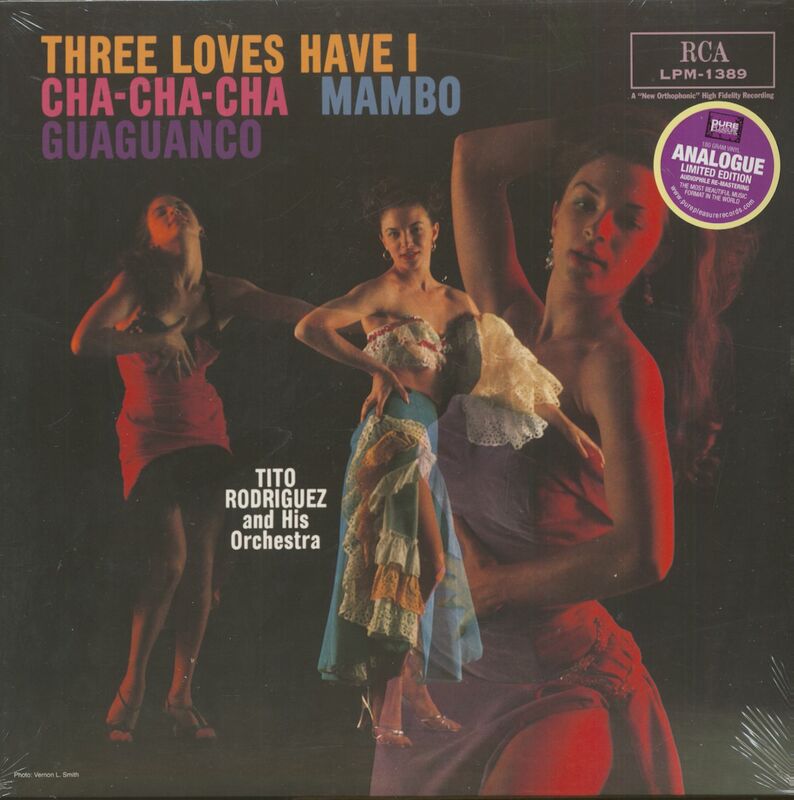 These are the rhythms, the mambos, the cha-cha-chas and guaguancos that Tito Rodriguez and his orchestra present in this colorful album of modern Latin-American dance music. The arrangements are skillful and sophisticated, the moods are exciting and romantic, and the music, with a little imagination, takes you quickly to exotic lands and new adventures. From Santiago to Port-au Prince, from Martinique to Rio or Montevideo, this is the kind of pulsating music that is a thrilling part of the tropical scene. In luxurious casinos and palatial hotels, the scintillating beat of native bongos, maracas and castanets serves as background accompaniment to suave international night life. There is dancing under the stars on magnificent outdoor pavilions, and there is dancing in the street at carnival time, and riotous colors of the fiesta costumes reflecting the carefree mood of the revelers. A rumba is danced by grinning youngsters in front of a sidewalk café. ... In a dimly lit, smoke-filled cellar, a jovial bartender joins his customers in a mambo that rocks the rafters. ... In a native club, a tourist tackles a fast-stepping samba—and he does it surprisingly well. It is easy to visualize these scenes when listening to the music of Tito Rodriguez. It is just as easy to understand why the selections included in this album are so brilliantly arranged and so beauti-fully presented. The reasons are simple. 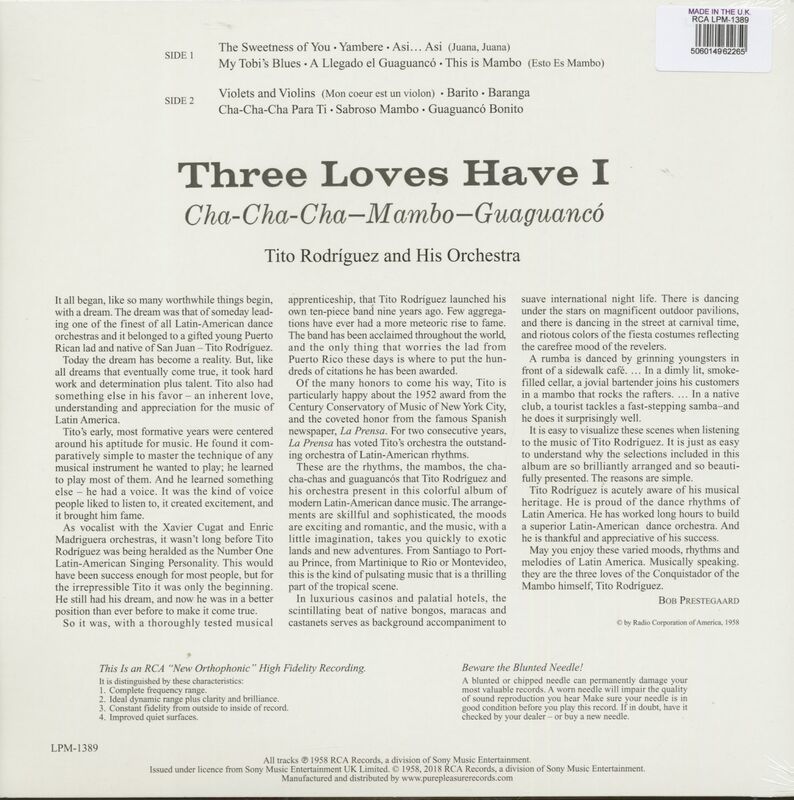 Customer evaluation for "Three Loves Have I - Cha-Cha-Cha, Mambo, Guaguanaco (LP, 180g Vinyl)"